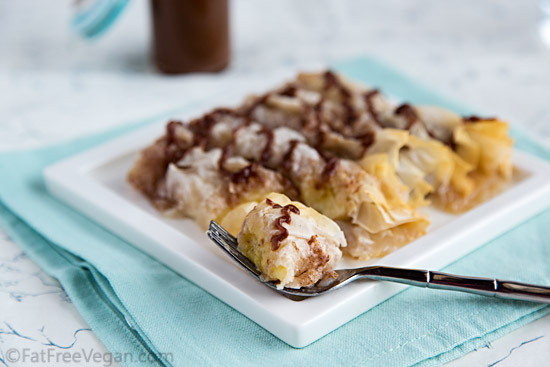 My daughter and I came up with this recipe one afternoon when we were in the mood for a quick treat and I had some leftover phyllo dough in the fridge. We call it “Wrap Your Banana,” but that sounds more like a public service announcement than a recipe! Normally we just sprinkle it with a little cinnamon sugar, but that’s so ridiculously easy that I hesitated to post it, so I fancied it up with a rich-tasting chocolate sauce that is free of refined sugar and fat. If you’re using frozen phyllo, place it in the refrigerator to thaw at least 24 hours in advance. Have your work surface and all your other ingredients prepared and ready before you remove the phyllo from the fridge. Work quickly. Unwrap the dough onto a clean surface lined with parchment or plastic wrap. Cover it with plastic wrap and a damp kitchen towel and keep it covered as much as possible. If a sheet tears slightly, don’t worry. You can probably still use it in this recipe. If it’s too torn, just throw it away and get another. When you’re finished, wrap the leftover phyllo in the plastic wrap and then place it in a zip-lock bag. It’ll keep in the fridge for another week or in the freezer for 2 months. Or better yet, keep it out and make my delicious Spinach and Artichoke Pie for dinner. 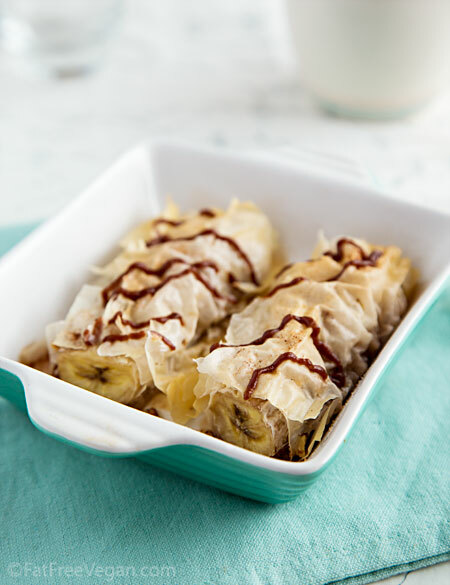 The trick to this easy dessert is to bake the bananas long enough to lightly brown the top of the phyllo while the bananas become slightly caramelized and begin to exude a delicious syrup. Be sure you capture all of that syrup and spoon it onto the finished dessert. I like to divide the banana syrup among the plates and put the baked bananas on top and then add a drizzle of chocolate sauce. But if you don’t want to take the time to make the sauce, this dessert is equally delicious with just a sprinkling of cinnamon and sugar added just before serving. If you’re not a chocolate fan, try these sprinkled with cinnamon sugar after they’re baked. Unroll the thawed phyllo dough and place it on your workspace. Quickly cover it with plastic wrap and then a damp towel so that it doesn’t dry out. Remove one sheet and place it on a cutting board or other work surface. Place one peeled banana along one of the narrow ends, Sprinkle the dough evenly with a fourth of the walnuts. 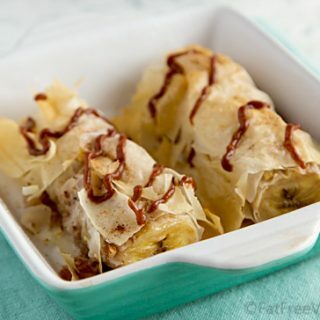 Sprinkle the banana with a dusting of cinnamon and then roll it up in the phyllo. Place it seam-side down in the baking dish. (If making in single-serving dishes, cut wrapped banana in half and place halves in dish side by side.) Repeat with remaining bananas. 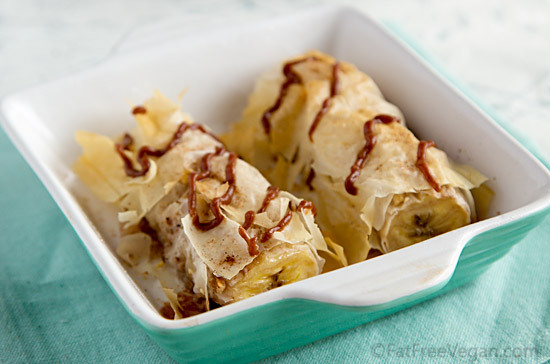 Give the tops of the wrapped bananas a quick (1/2 second) spray with canola oil (or try brushing with non-dairy milk). Bake for 20-30 minutes, until tops are golden brown and bananas have begun to sizzle and release a syrup. To serve, cut bananas in half and place two halves on each plate, along with some of the banana syrup from the baking dish. Drizzle with about a tablespoon of Chocolate Sauce. For best results, serve immediately. The walnuts keep the layers of phyllo separate so that they don’t become soggy. I don’t recommend leaving them out unless you’re willing the spray the phyllo with oil before wrapping. Tightly wrap the leftover phyllo and seal it in a plastic bag. It will keep in the refrigerator for up to a week, or you can refreeze it for up to 2 months. Try spreading a light coating of raspberry or other preserves on the banana before wrapping it up. Place the chopped dates in a bowl and pour the boiling water over them. Allow them to soak for about 10 minutes. (Note: Some dates are not as soft as others–soak them longer.) Then place dates and water in blender container along with remaining ingredients. Blend until smooth, scraping down sides of container a couple of times to ensure everything gets blended. Susan Voisin, I love you. (I love your recipes too). I was just reading recently about how much sugar and fat the average person eats over the holidays. I will feel so happy to make this recipe. And I should have thought of date sweetened chocolate sauce myself but I didn’t, of course. I needed you to do that for me. “We call it “Wrap Your Banana,” but that sounds more like a public service announcement than a recipe”. LOL. Seriously–just cracked up at my desk reading that. I think simple desserts/treats are the best. This was a great idea! Bananas I’m not so crazy about (unless they’re in the form of vegan soft serve), but this recipe sure does make them appealing! What I’m most excited about, though, is the date sweetened chocolate sauce. I eat chocolate and dates together as a snack quite often, but I can envision replacing that with this sauce drizzled over all sorts of things! Ruth, I think 4 packed tablespoons may be close. If you’ve got a scale, I could find out the weight and let you know. I have a scale. Thanks! I love baked bananas! I have made them in the past where they come out a little too mushy, so the idea of wrapping them in phyllo sounds like it would work well without adding such a heavy element. Looks delicious! I would so love to try some. I am sure it tastes great. I love your blog and your recipes. I’ve learned recently that I am gluten intolerant and I’d like to know what your flour of preference is when making GF alternatives. I’m going to make the blueberry-banana bread and would like to know what flour of choice you used in the GF version. I have a natural blended GF flour that I will try with it. Will let you know how it turns out. BTW, my family loves the brussels sprout-Shiitake mushroom soup. It’s a favorite with us 😀 Have a great day, Susan! This looks delicious! So tempting. I might have to think of a version that uses rice papers or brown rice tortillas. A banana dessert tostada with date carob sauce anyone? Or something like that. LOL I love the colors in the photo, and what looks like an heirloom pyrex dish to me. Thanks, Moonwatcher! I was wondering how you would de-gluten it! I like those ideas. And I’m not sure about the dish. I bought two of them at an antique store, and they look old to me, but they’re not marked so I can’t be sure what they are. They look amazing! I love baked bananas but they usually only happen during barbecue season (baked in foil on the grill!). Love the chocolate sauce idea! When I was in Asia, I used to buy a street-food that was banana wrapped in a phyllo-like pastry, deep fried, and sprinkled with brown sugar. They were heavenly! I just made this with vegan chocolate chips sprinkled on top instead of your chocolate sauce and it was yummy. Thanks for the great recipe and blog!.Do you have a spanokopida type of recipe? These look so delicious! What a clever use of phyllo for a little treat. It seem a lot less labor intensive than the spanokakopita or the samosas I usually make with the trickiest dough ever. Cheers! I wanted to report back on how a gluten free chocolate free version of this lovely dessert turned out. Tasty and fun to eat! I bought spring roll skins. Since they come hard and stiff and round like tortillas, I soften them by immersing them one at a time in a pie plate full of warm water. Once softened (but not too soft), I put them on a slightly damp towel on the cutting board and pretty much proceeded with your recipe in terms of rolling the banana in it (I didn’t have any, but I think a nice addition with the walnuts might be a little orange zest). The curve of the banana fit nicely with the curve of the skin so it was easy. I didn’t have cooking spray, so I made a little “flax egg” and lightly coated the tops with that. Then baked. I made the sauce as you wrote, substituting carob powder for cocoa powder and adding a little vanilla. I halved both recipes, since it was just for me and my friend Linda. The sauce came out a little thick (might have been rushing with the soak time on the dates), more like smooth icing, but it was delicious nonetheless. The skins hardened during baking, and remained somewhat transparent, a different effect than the phyllo. We spread some sauce/icing over the top. I cut mine up to see how hard or easy it was to do that, and Linda just picked her halves up and ate them. That worked really well, she said, like a cannoli! The texture of the cooked banana was wonderful and creamy inside the spring roll skin. Made this way they can be eaten by hand, like a pastry! She kept asking me, what’s in this? It’s really good. So I think I have a winner here, albeit a different variation, since nothing approximates phyllo dough but phyllo dough. The fact that they can be eaten in hand like a pastry adds another fun dimension. I hope to make them again when the kids are here, and for other friends, too. They seem like something kids will like, if that opportunity presents itself. I think also next time I will set them on baking parchment because of the way the skins harden. This will make them easier to lift off and eat my hand, if desired. I’m so glad that worked out for you! I had wondered if the rice paper skins would get too hard, but I guess they were not too hard to eat. Thanks for reporting back! Thanks, moonwatcher, for this idea. I happen to have spring roll wrappers right now and I love this idea for them! Hi dyanne, you’re welcome. I hope you enjoy the gluten free version! I just wanted to tell Susan and you that tonight I experimented with frozen mango chunks wrapped in the Spring roll skins. This worked very well, too. I cut it in thirds where there was a space in the chunks. Very easy to pick up and delicious. Played with the flavorings.This may become an adaptations post, Susan!! Very delicious inspiration. 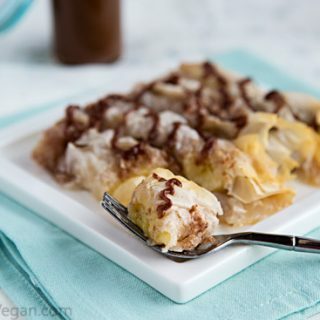 I liked the bananas and phyllo in this recipe but the dates replacing sugar in the sauce were way too sweet for my taste and overpowered the flavor of the chocolate. Since there’s nothing purer or more natural than sugar from a cane plant, why not just make a “real” chocolate sauce? I’d rather have less of the real thing than compromise the taste of chocolate. I have made vegan Spanakopita and brushed almond milk on the top instead of the oil to keep it from drying out….do you think that would work with this recipe? Nice straightforward instructions. Learned some inventive stuff here. Perfect since I just bought some fresh bananas. Gonna start once my brother arrives with the phyllo. I’m sure this will be awesome.